Review of clean energy-related bills in this session of the Legislature will continue. There are almost 2,000 bills this legislative session, so it’s a lot to consider! Climate Emergency Resolutions: 350 Marin helped get another resolution passed in Fairfax. Media covered a robust plan for detailed EV Adoption strategy in San Anselmo by a member of their Sustainability Commission supported by 350 Marin. 350 Bay Area continues work at the CPUC to support rooftop solar and Community Choice Energy providers. Pressure local government to require refineries to post Risk Bonds for financial damage along with restoration of authority of Air Quality districts to control emissions. A proposed resolution would provide and fund a detailed particulate plan that will reduce emissions of small and larger particulates; Note: there is no safe level of small particulates (PM2.5). The Transportation Team, working closely with 350 Bay Area Action’s Legislative Committee, are following Assembly Bill 40—a Zero-emission vehicles study bill. Be prepared to rally for support it as soon as it’s in committee. The team has targeted April for an EV101 class. The Sierra Club’s local Energy Committee is joining the Electrify Everything coalition, an education effort spearheaded by 350 Bay Area and 350 San Francisco, one of our local groups. 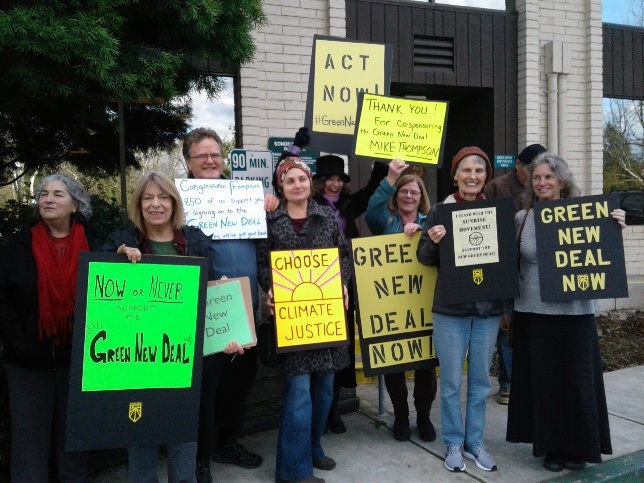 Members from Climate Reality and Interfaith Power and Light plan to attend the March 12 speaker training. This team has been busy training new volunteers, reviewing bills, taking positions, conferencing with other climate and environmental groups, talking with transportation leaders, consulting with legislators, and working on organizing these efforts. More volunteers are needed. Get involved! The most fun for last: Youth vs. Apocalypse made national news when they were invited into Senator Feinstein’s office from a Sunrise Movement-organized rally. A video of the encounter went viral and has made an impact on the Green New Deal conversation, weakening the position of Democratic moderates like Feinstein, who withdrew her substitute bill. You haven’t heard the last from this youth group.